Deery pavement-preservation and waterproofing solution, extends the service life of roads and bridges throughout North America. Deery pavement-preservation products, protects asphalt and concrete pavement from destructive thermal forces like freezing winter temperatures. Deery products can take the heat. Deery is a pavement-preservation solution that is designed for many climates including hot desert summers. 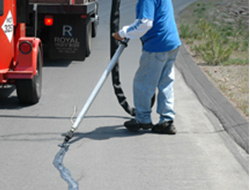 Deery crack sealants extend and preserve of the service life of asphalt pavement. When it comes to durable repairs, DEERY’s got the name. DEERY pavement preservation product line includes proprietary formulations that create a full line of Crack Sealants and Fillers. The DEERY line of products includes Super Stretch®, and Level & Go®. The FBJ-6297 Bridge Joint System® is suitable for joint replacement and new installation of expansion bridge joints, and has been noted for its ease, efficiency and outstanding results. The DEERY Bridge Joint System® is a better system for the new construction or repair of expansion bridge joints. The exclusive material formulation and application procedure virtually eliminates rutting and migration, and produces a smooth riding, long lasting joint, that’s ready for traffic as soon as the material cools. DEERY Brand of Pavement Preservation Products include a broad range of superior quality ASTM, AASHTO, FAA, Federal and Specialty products for new construction and preventative maintenance of asphalt and concrete applications around the world. 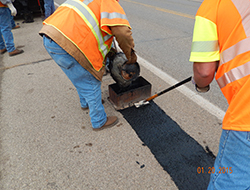 Since 1976, Crafco is the world’s leading manufacturer in quantity and diversity of packaged pavement preservation products for asphalt and concrete such as hot-applied crack sealants, silicone joint sealants, hot-applied mastics, and cold-mix for pavement surface patching and repair. Since 1945, Copeland has been manufacturing and applying quality athletic surfacing products as well as pavement preservation and maintenance products. Copeland has built a reputation on outstanding quality, service and value. 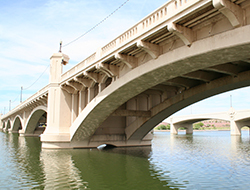 Ultraseal Waterproofing & Sealant products protect roads, bridges, and buildings from hydro harm. Our solutions are successful and we service our customers by providing beneficial support in the form of comprehensive design review and technical advice during construction and application. DEERY Pavement Preservation Products are the perfect solution for extending the life of asphalt and concrete roads and bridges throughout North America. The DEERY product line is the industry standard for sealing cracks, repairing pot holes and reconstructing bridge joints. DEERY's proven preservation and waterproofing technologies are the first-choice for individuals, contractors and public-sector agencies involved in the maintenance of roads, highways and bridges. 6165 W. Detroit St., Chandler AZ 85226. © 2019 Crafco, Inc. All Rights Reserved.